The search giant again came up with its latest acquisition of online poll startup Polar to enhance the Google's social network. 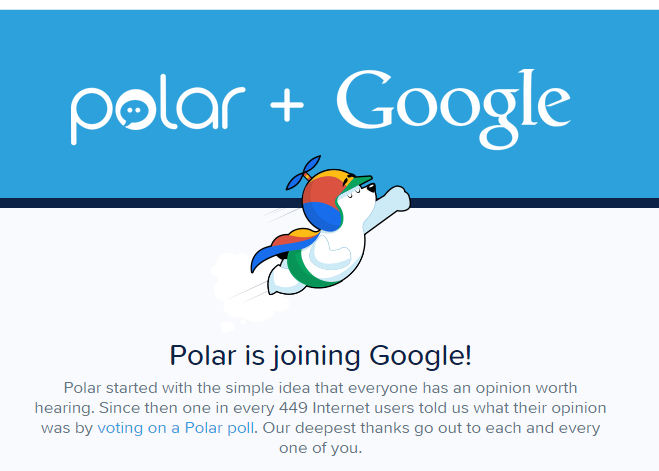 The deal and terms were not disclosed but Google confirmed that the Polar team will work on Google+. Polar is proudly announcing its teaming up with Google on its website. Just a two-year-old startup Polar that polls users of its app via Smartphone and tablet to learn users’ preferences. It has served more than half a billion polls in the past eight months and counted 1.1 million active voters as of this month. Polar website will be available for its users through the end of the year. It is allowing users to download an archive of the polls and data saved over their network.